By reproducing in the laboratory the complex interactions that cause human genes to turn on inside cells, Duke University bioengineers have created a system they believe can benefit gene therapy research and the burgeoning field of synthetic biology. This new approach should help basic scientists as they tease out the effects of "turning on" or "turning off" many different genes, as well as clinicians seeking to develop new gene-based therapies for human disease. "We know that human genes are not just turned on or off, but can be activated to any level over a wide range. Current engineered systems use one protein to control the levels of gene activation," said Charles Gersbach, assistant professor of biomedical engineering at Duke's Pratt School of Engineering and member of Duke's Institute for Genome Sciences and Policy. "However, we know that natural human genes are regulated by interactions between dozens of proteins that lead to diverse outcomes within a living system. "In contrast to typical genetics studies that dissect natural gene networks in a top-down fashion, we developed a bottom-up approach, which allows us to artificially simulate these natural complex interactions between many proteins that regulate a single gene," Gersbach said. "Additionally, this approach allowed us to turn on genes inside cells to levels that were not previously possible." The results of the Duke experiments, which were conducted by Pablo Perez-Pinera, a senior research scientist in Gersbach's laboratory, were published on-line in the journal Nature Methods. The research was supported by the National Institutes of Health, the National Science Foundation, The Hartwell Foundation, and the March of Dimes. Human cells have about 20,000 genes which produce a multitude of proteins, many of which affect the actions of other genes. Being able to understand these interactions would greatly improve the ability of scientists in all areas of biomedical research. However because of the complexity of this natural system, synthetic biologists create simple gene networks to have precise control over each component. These scientists can use these networks for applications in biosensing, biocomputation, or regenerative medicine, or can use them as models to study the more complex natural systems. "This new system can be a powerful new approach for probing the fundamental mechanisms of natural gene regulation that are currently poorly understood," Perez-Pinera said. "In this way, we can further the capacity of synthetic biology and biological programming in mammalian systems." 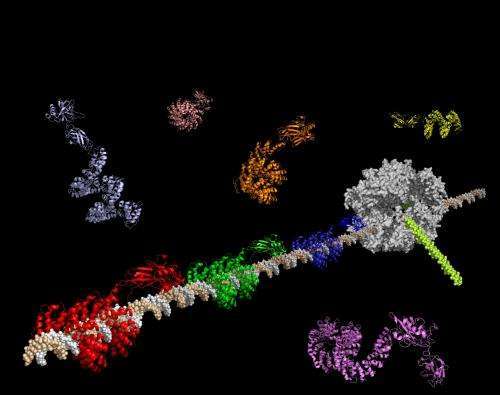 The latest discoveries were made possible by using a new technology for building synthetic proteins known as transcription activator-like effectors (TALEs), which are artificial enzymes that can be engineered to "bind" to almost any gene sequences. Since these TALEs can be easily produced, the researchers were able to make many of them to control specific genes. "All biological systems depend on gene regulation," Gersbach said. "The challenge facing bioengineering researchers is trying to synthetically recreate processes that occur in nature."